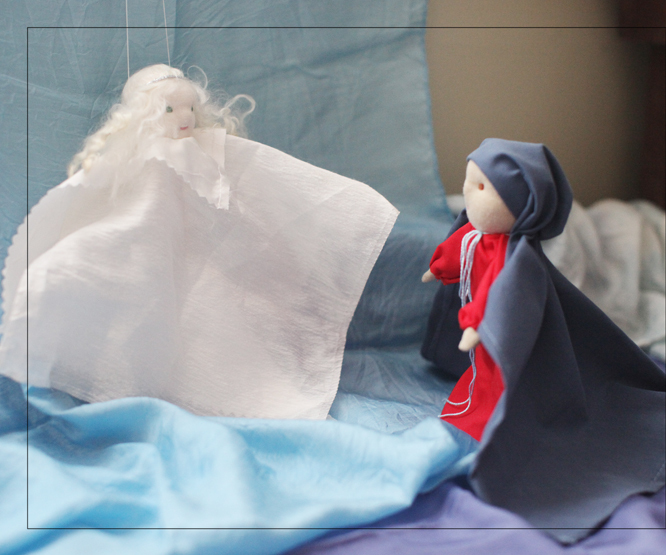 If you have been following the progress of our nativity dolls you may see the photo below and at first miss the change. Look again. Remember the post Headless Bodies? 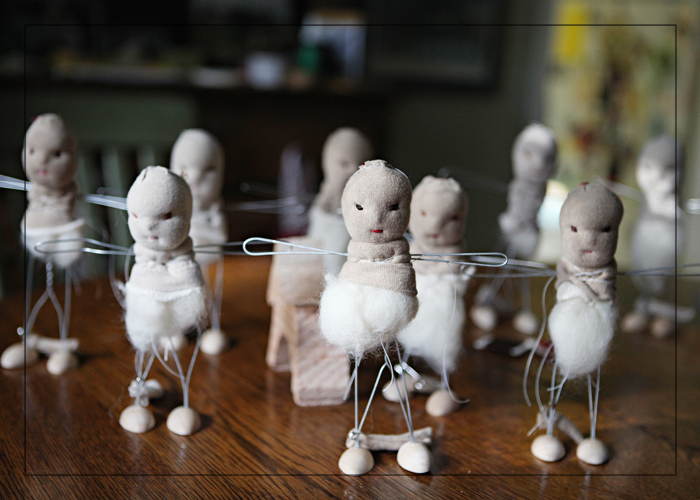 These dolls are made from 2 separate pieces of wire. see instructions in The Nature Corner on page 41. 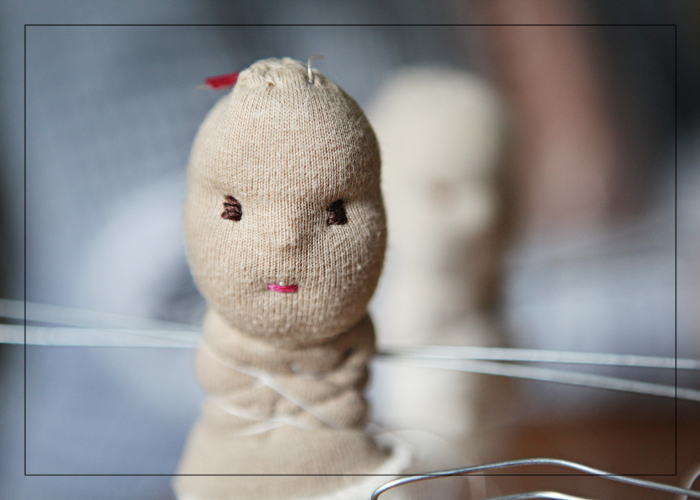 I do love these pose-able bodies, but I did not love the sharp end of wire that could pop out when the dolls are bent. 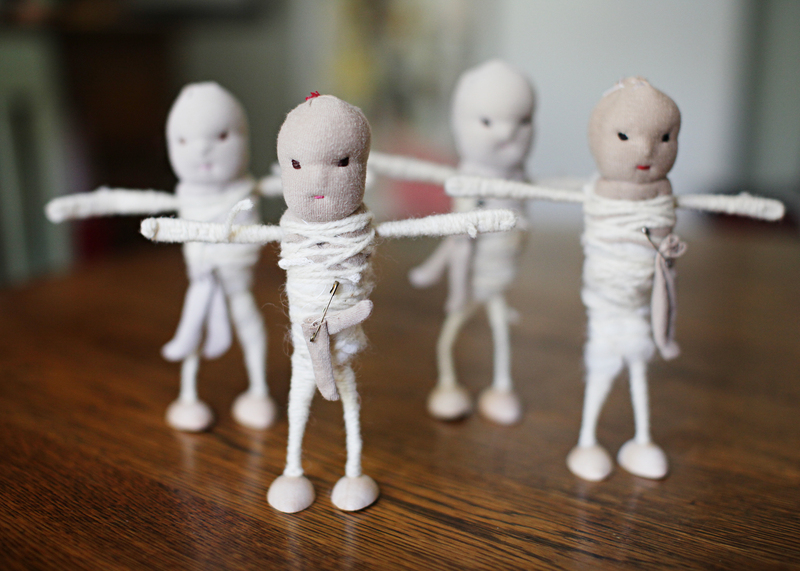 So I wrapped the dolls in wool yarn. 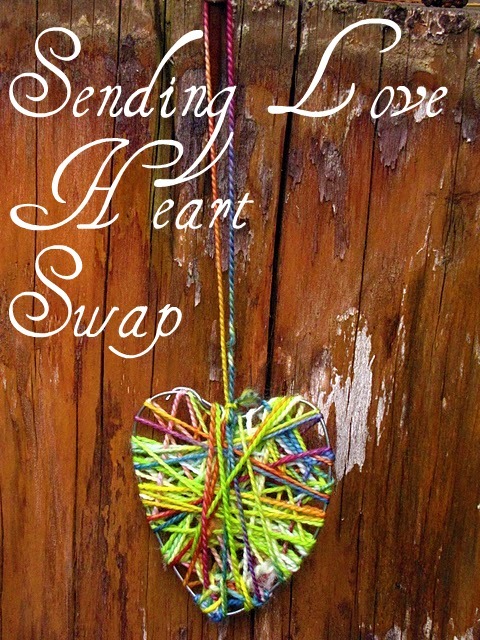 I started at an ankle with a slip knot and just a drop of tacky glue and wrapped up a leg and then over the abdomen (making sure to add a little wool around the middle where the wire ends were), then wrapped up to the opposite arm and ended in the hand weaving the yarn back through the wraps so it would stay tight. Then I started over again with the other ankle. 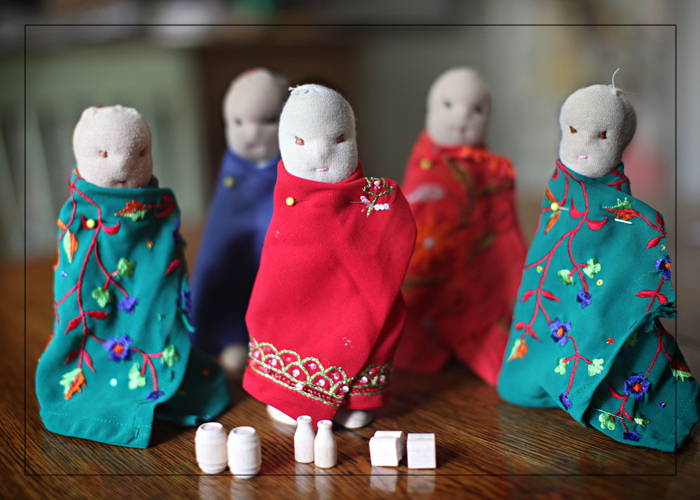 This step took quite a while and now some of my hand skin pieces are too small, but I think it will add to the kid-friendly-ness and longevity of these dolls. Now we get to dress! 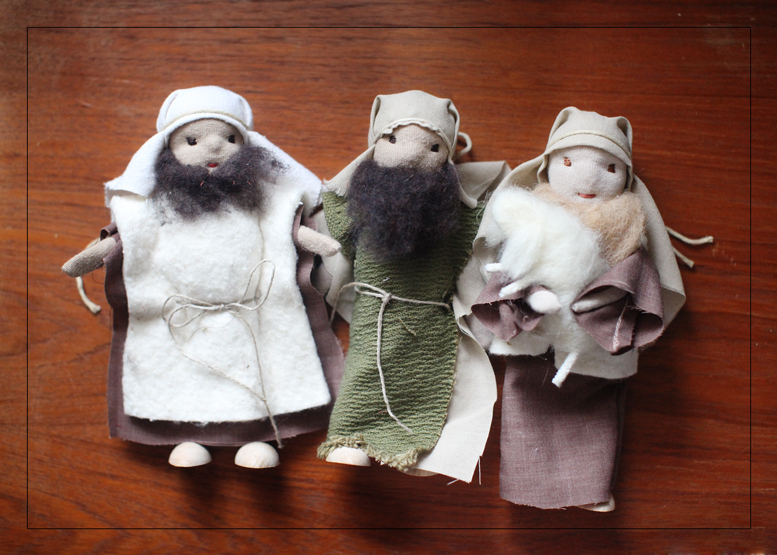 I started with the shepherds and modeled the from the puppet garment in Toymaking with Children (page 131). 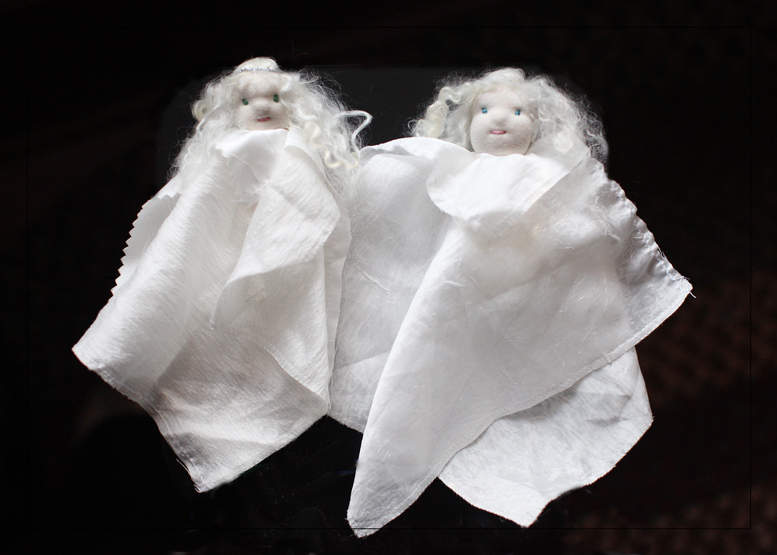 Then I made 2 kinds of wool-ish (I think it is actually a cloth used to wash cars, but it looks wooly) covers. 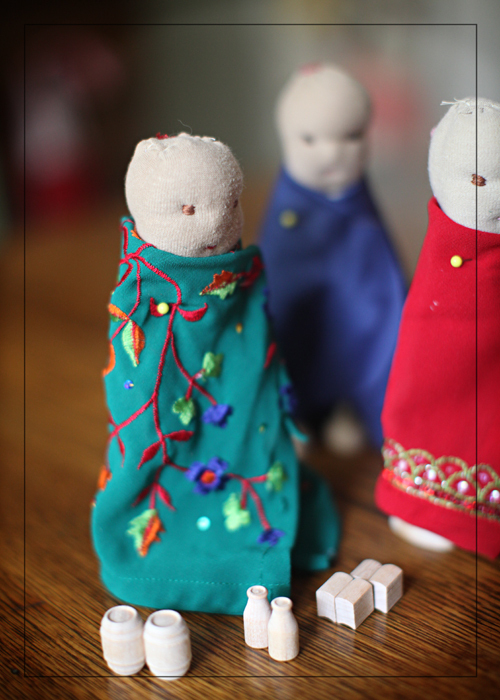 I made vests, based on the patterns in Kinder Dolls and I made a robe based on the puppet instructions in Toymaking with Children. 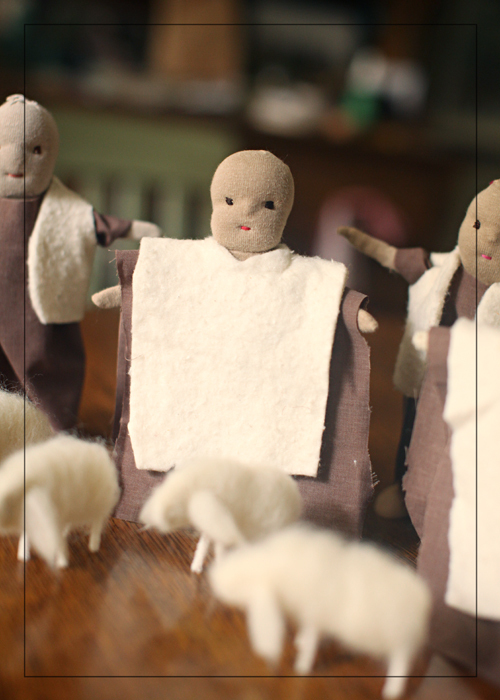 All the shepherd clothes are just pulled on and will need to be stitched. 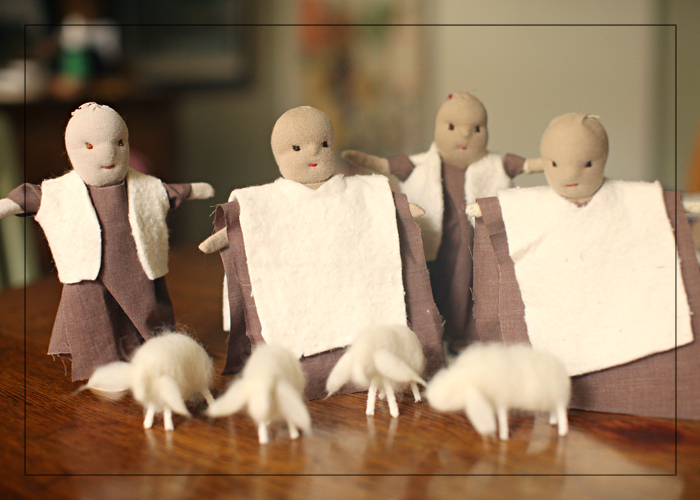 I couldn’t resist making them some sheep! And I wanted small, light-weight sheep that these guys could carry. I used the instructions on page 59 of Toymaking with Children, but I used 6 inch pipe cleaners to make the sheep smaller. 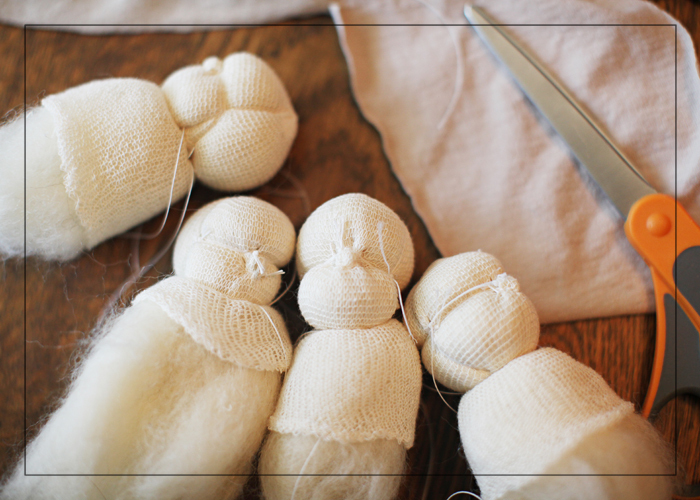 I was able to skip wrapping the legs since these sheep are so small. 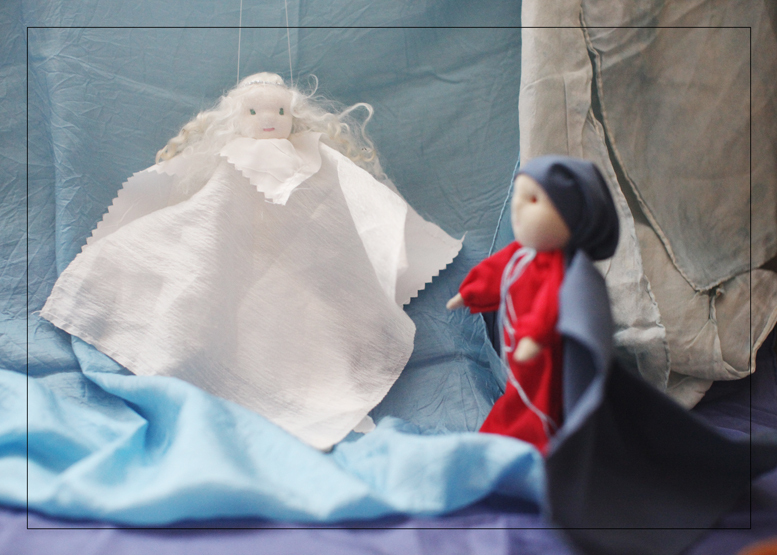 I have roughly sewed the white under garments for the kings and will need to hem & sew the beautiful outer robes. 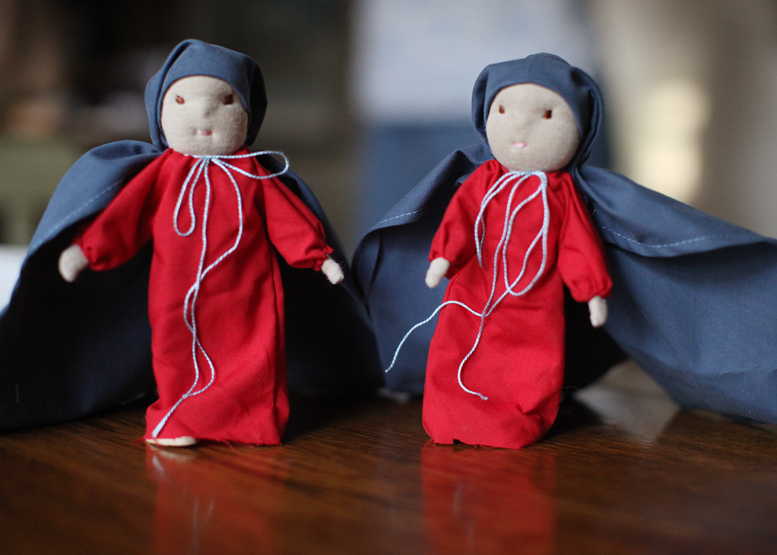 The red & green guys already have rich embroidery and I will just need to sew some trim & beads onto the blue. If you have read this far in our journey, then you know I love Casey’s Wood Products! I especially love their sales and I’m thrilled over the moon when I find a use for something I bought on a whim! Well these little doll house sized milk bottles, barrels and books (2 ‘books’ glued together to make a square) may not look like much now, but just wait till I get a hold of them with my glitter paint. 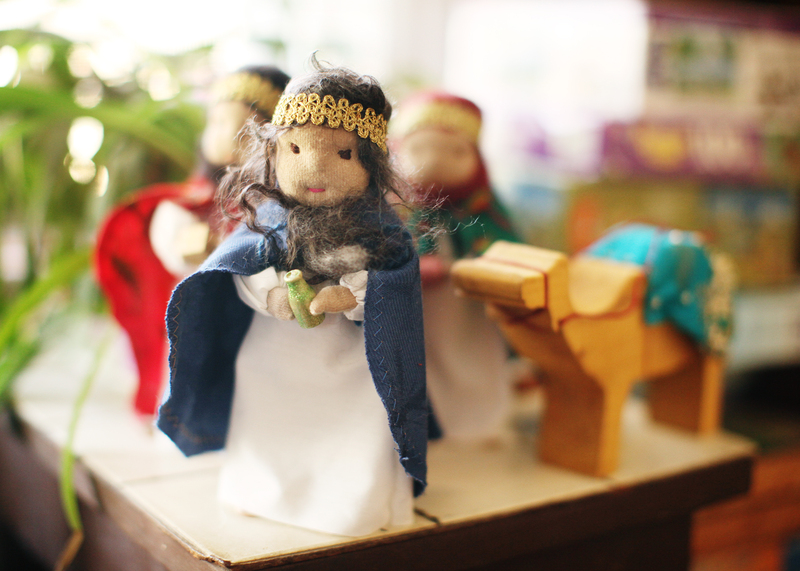 You too will believe you are seeing gold, frankincense and myrrh. 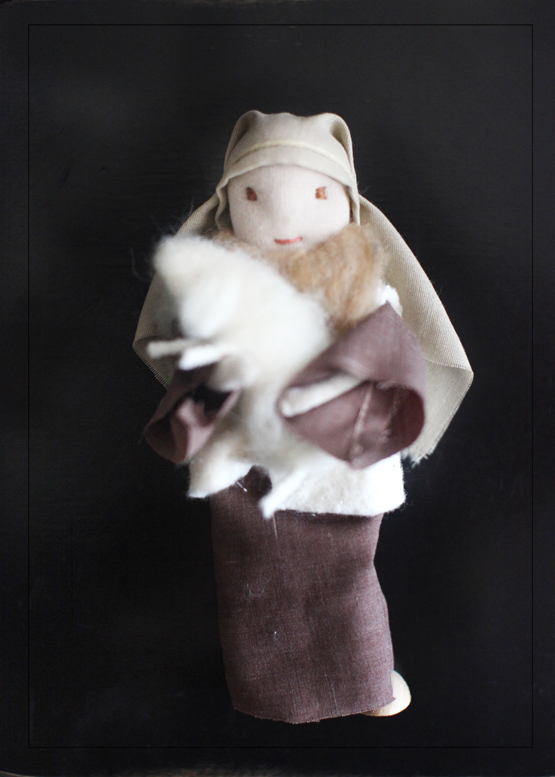 So there is still lots to do, but with only a month to go till the start of advent . . . yikes . . . I’d better get busy! Thanks Lindsey for the great photos! Spread sunshine all over the place. And put on a happy face. 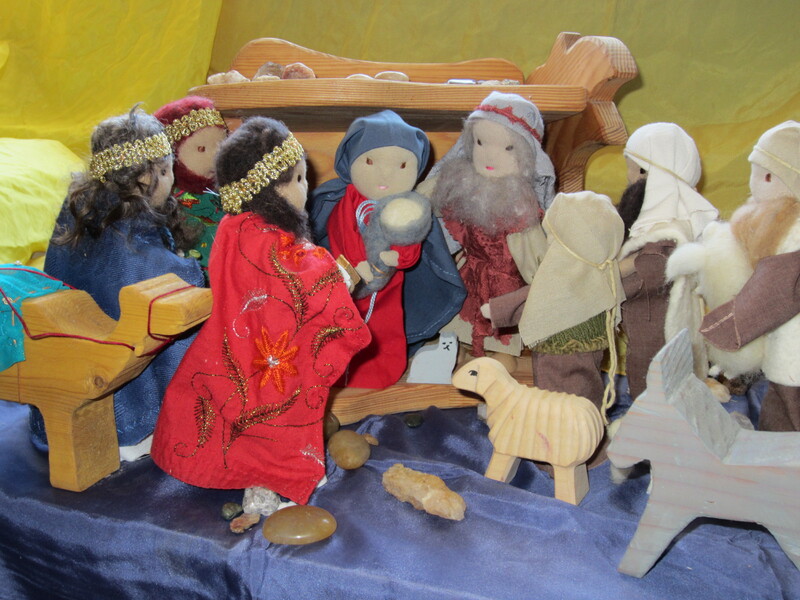 Lindsey got some great photos of our nativity folks. 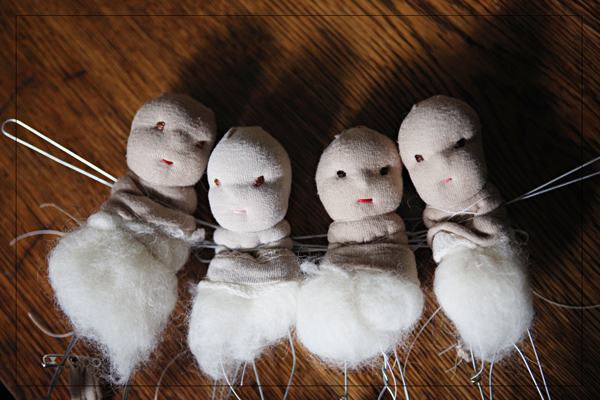 All 19 dolls have beautiful faces! After a bit of ‘body work’ to fill out their limbs, we will be able to add hair and clothes. It is fun to look at them and see them looking back! Do you see Mary? Joseph? a Wise Man? a Shepherd?